For my previous post on "American Whites like American blacks are dying young," see here. I think the Deaton/Case study's finding of sharply increased mortality rates in that age range (45-54) refers specifically to people whose formal education did not go beyond high school. (The identified causes -- namely suicide, alcohol, prescription drug overdoses-- can be tied, at least by inference, to economic distress, as you indicate.) But the finding does not pertain to most whites, rather to that specific group of them (suggesting a possible concentration in depressed rural areas or small towns). That's my recollection of the NYT article, at any rate. --Louis"
"This new paper by Angus Deaton and Anne Case on mortality among middle-aged whites has been getting a lot of attention, and rightly so. As a number of people have pointed out, the closest parallel to America’s rising death rates — driven by poisonings, suicide, and chronic liver diseases — is the collapse in Russian life expectancy after the fall of Communism. (No, we’re not doing as badly as that, but still.) What the data look like is a society gripped by despair, with a surge of unhealthy behaviors and an epidemic of drugs, very much including alcohol. There’s a lot to be said, or at any rate suggested, about the politics of this disaster. But I’ll come back to that some other time. For now, the thing to understand, to say it again, is that something terrible is happening to our country — and it’s not about Those People, it’s about the white majority." In addition, Latinos still tend to have stronger families than blacks and whites. Perhaps that is a reason why the usual effect of racism does not result in so many early Chicano deaths - in fact, Chicanos between 49-54 have fewer early deaths than the French and the Germans and have the same rate as the English. .On the usual pattern, for example, 1 in 3 black males born in 2000 could expect to be involved with the prison system, 1 in 6 Chicanos - less, but still harsh - and 1 in every 17 whites, lower but still, in comparative, international terms, outrageously high, according to the Department of Justice. (Perhaps Hillary should get a grip on Denmark...). "Alan, an article I read gave free trade agreements as major cause of these deaths. Millions of manufacturing jobs went to other countries through outsourcing, taking many if not most of the jobs these men [sic - and women] had..
No jobs for workers, the smashing and erosion of unions leads, in every American community to some 20% lower wages and worse social services (see Richard Freeman, the insightful Harvard labor economist, here, here and here, and Joe Nocera's sudden self-recognition, based on Freeman's work, here). Or consider the argument of Thomas Piketty, Capital in the 21st Century, on how Kuznets was wrong about the tendency of capitalism to improve lives for all See here. There is no basic tendency in capitalism to raise wages and create a middle class life style (or even a stable middle class) except through unionization and repeated democratic movements from below. In this setting, Obama's intervention at the depth of the depression to save General Motors, even with the de-toothing of the United Auto Workers, was an important positive step (letting speculative banks go under and trying to regain control of parasitic finance would be positive; destroying what is left of industrial jobs for Americans is not). Krugman is also right that this phenomenon is sharper and more frightening than in Europe, Long struggle, amplified by defeat of the Nazis in which the Soviet Union and the US played a leading role, means stronger European health and education policies, serving a common good, despite experiencing a worse depression. And in the US, there is increasingly less industrialization - even war-manufacturing and computers have been outsourced to China... - a more all-around attack on black people and a very frightening, free fall of despair for many ordinary whites. The argument I made in the last post, invoking Michael Reich, is a general principle that divide and rule is key to capitalism (in Europe, younger workers can't find jobs; working women are discriminated against; immigrants are often treated horribly, for instance as Algerians are in France, Turks in Germany, Moroccans in Spain, though Angela Merkel, to her credit, has led efforts to welcome Syrians, and the injuries of 6 immigrants, attacked by mobs this past week in Germany here, are not yet, fortunately, "mainstream." But what is generally true, as those who are saddened/frightened by Deaton's and Case's discovery realize, has been extended in a shocking, new way. 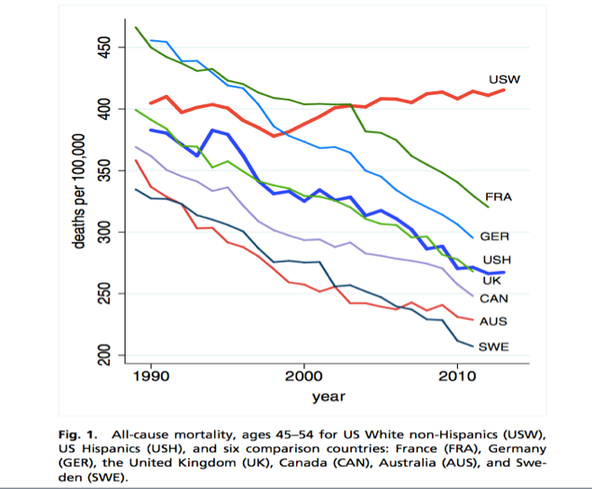 Yes, wages and incomes suffered for whites from divide and rule, but life expectancy did not go down (white male life expectancy is a quite lot lower in America than Europe - call this the effect of imposing divide and rule by the elite even more fiercely on blacks, a caste in W.E.B. Dubois's apt words, and thus, also more fiercely oppressing whites. But dying young is unusual.